Candy-striped roadcuts and lava-bubble caves offer geological whimsy and breathtaking vistas. The bright orange car swayed slightly on a thick cable as it rose up the slope of 5,632-foot Ranger Peak carrying a park employee, two tourists and me. 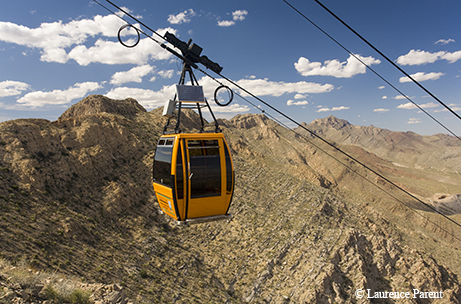 Cars on the Wyler Aerial Tramway in the Franklin Mountains near El Paso make a four-minute trip past 600 million years of geologic history. The trip starts at the bottom with Red Bluff granite, molten magma that crystallized a billion years ago. Above that granite lies Bliss sandstone, made of sand and creatures from a sea covering the area 550 million years ago, and above the sandstone, alternating layers of limestone, some 900 feet thick. At the top we see dolomite, or magnesium limestone, also left behind by a tropical sea. Higher parts of the Franklin range contain a 5,000-foot-thick layer of Precambrian rock perhaps 1.26 billion years old, according to University of Texas at El Paso geologist David LeMone. The Precambrian era spans about 88 percent of all geologic time, from the formation of Earth some 4.5 billion years ago up to the Cambrian Period, which began about 541 million years ago. When the El Paso area faulted 20 million years or so ago, it lifted and tilted these layers of ancient rock to form the mountain range. 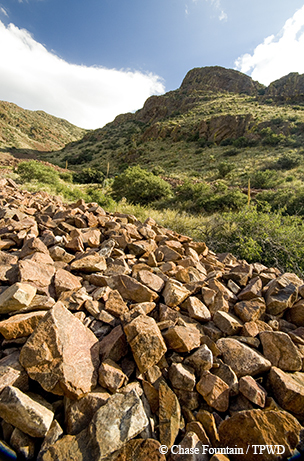 Today, Franklin Mountains State Park encompasses 26,627 acres (40 square miles) and the Tramway another 195 acres, almost the entirety of the mountain range, all of which falls within El Paso’s city limits. Welcome to the largest urban wilderness park in the continental United States and home to some of our oldest rocks. The Cottonwood Springs Trail takes hikers into a lush canyon, where elevation changes and gravelly terrain add difficulty to the hike. I found hiking the best way to get up close and personal with all that cool rock, as well as to encounter desert plants and animals and experience stunning views seemingly around every corner. More than 100 miles of trails cover the park, many of them remote and rugged. Access points can be found on all sides: McKelligon Canyon and Chuck Henrich Park on the east; New Mexico Highway 404 on the north; Transmountain Road; Arroyo Park, Palisades Canyon and the Tramway to the south; and the Tom Mays Unit and Redd Road area on the west. Weickhardt considers the North Franklin Peak and Ron Coleman trails to be the park’s most epic paths. Ron Coleman runs only 3.8 miles from McKelligon Canyon (the recommended start point) to the Smuggler’s Pass parking lot on Transmountain Road, but it’s rugged and steep, with 1,750 feet in elevation change. Midway through, you have to surmount a steep section using four sections of chains. 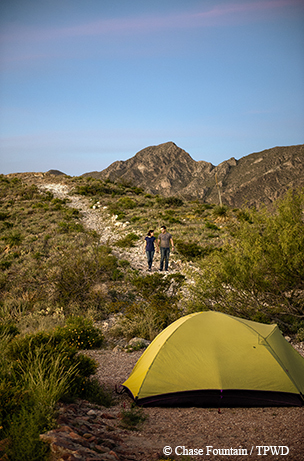 Hiking and camping are popular activities in the park. Hikes to North Franklin Peak, the range’s highest at 7,192 feet above sea level, start at Agave Loop in Tom Mays and follow Mundy’s Gap to the North Franklin Peak Trail and 2,180 feet up to the windswept peak. A hike and bike trail map from GeoBetty and a Ron Coleman Trail map from TPWD are available at the McKelligon Canyon headquarters facility. After my Transmountain Road traverse, I pulled into the Tom Mays Unit for an easy, family-friendly walk along the Nature Trail. I passed a variety of yucca and ocotillo and several of the largest barrel cactus I’d ever seen, and spotted a colorful greater earless lizard. A bird blind offers frequent sightings of black-chinned, rufous and calliope hummingbirds, along with black-throated sparrows and house finches. I also flushed a number of Gambel’s quail and spotted several hawks circling above on my hikes. Upping the ante, I headed for the Aztec Caves, a hike of about half a mile each way and a 500-foot climb. Early El Pasoans found bones and artifacts inside these caves — which are believed to have begun as giant air pockets in ancient lava flows — and bestowed the inaccurate name (Aztecs lived in central Mexico). I soaked up a wide vista from the mouth of the larger cave, which has two high chambers (those were some big bubbles) and rested in the shade at the mouth of the smaller one. Along the way, I saw hummingbirds, lizards, butterflies and a ground squirrel. Sotol, yucca and other desert plants cover the hillsides at Mundy’s Gap. For my last trek, I chose Cottonwood Springs. Chokecherry and cottonwood trees surround this desert spring and attract a wealth of birds. While only about two miles round-trip, this hike has elevation changes and loose scree (gravelly terrain) that make it a bit challenging. Other unique hiking opportunities abound at the park, including periodic guided mine tours on the West Cottonwood Springs Trail. Tin Mine, the remains of the only tin mining operation in the continental U.S. (active from 1910-15), is about a six-mile round-trip hike, and you’ll need a light to explore the two old mine shaft entrances. Park rangers offer regular guided hikes, including those for dog owners, women and fitness buffs, and the park’s plan to add backcountry camping will make these mountains even more of a hiker’s paradise. Mountain bikers can access six loop trails from the Tom Mays Unit, ranging from 6.2 to 15.5 miles in length, most of them demanding a fair amount of experience. In total, more than 80 miles of park trails are open to biking as well as hiking. In addition to its fascinating ancient geological history, this area boasts a rich human one. 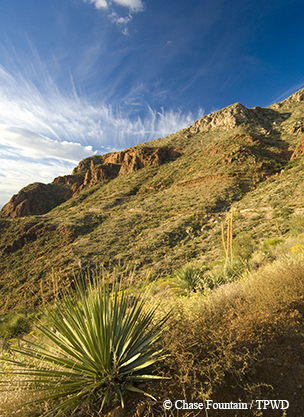 The city of El Paso sits in a narrow gap between the Sierra de Juarez to the south and the Franklin Mountains on the north where the El Camino Real de Tierra Adentro wagon trail crossed the Rio Grande. Native Americans occupied this area for more than 12,000 years, and Spanish conquistadors first passed through in the 1580s. In the four centuries since then, soldiers, priests, traders, adventurers, gold-seekers, entrepreneurs and ordinary citizens have navigated the gap. On my hikes, I became just one more in a long line of humans leaving their footprints on these ancient rocks. Wyler Ariel Tramway: Open Fri - Sun only. $8 per person ages 13 and older. $4 per person under age 12.